We are excited to present this guest blog by John Blischak of Blischak Law, a criminal defense law firm in Phoenix, Arizona. People are judgmental, and we often strive to conform to a rather strict set of social standards that few can truly achieve with perfection. If you’re a man, you’re expected to stand up for yourself. You can be aggressive and violent, but only if you’re playing a contact sport. You grow up given trucks and dinosaurs to play with, but don’t even think about touching that barbie doll. If you’re a man, you’re not allowed to cry. You’re not allowed to cuddle with another man. And you’re certainly not allowed to dress up like a woman. Cross-dressing is most definitely frowned upon, but gay men have found a way to take it to the extreme. And that extreme is one of the greatest things in the world: the drag queen. But what is a drag queen exactly? Most drag queens are men. They dress up like women (like, really really well), and they exaggerate the feminine qualities of women (also really well). They might do this for fashion or they might do it for entertainment, it’s their personal choice. A drag show often consists of a performer telling jokes, singing, dancing, and lip-syncing. No matter what the reason, drag queens have become an important and major part of gay culture. It should be noted that while many drag queens are gay, and the drag queen is most definitely a strong gay symbol, not all those who perform as drag queens are gay. A drag “king” is a woman who dresses up as a man. There are a number of myths that arise because of the nature of this phenomenon. Naturally, most of them arise from the mouths of perpetually dumb straight people. One common myth is that drag queens have an intrinsic desire to be women. Sure, some drag queens are transgender, but then again some drag queens are straight. People dress up because it’s fun. It’s a different kind of fun to dress up like another person and experience life in a different way. But more than that, dressing up in drag is an art form. It doesn’t make those who choose to do it less masculine or less manly than anyone else. It just means they like participating in a different form of entertainment or art than a lot of the psychologically-conditioned people outside of the gay community could possibly understand. There are different kinds of drag queens as well. 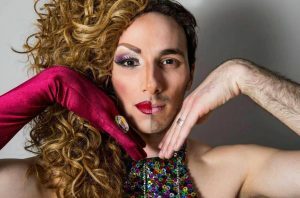 Not all men shave, and not all drag queens shave either. This phenomenon is often called “bear” or “skag” drag. Because drag is an art form, it is up to the individual to decide how he or she wants to present the art! Many people are unfamiliar with the concept of drag or what it really entails, but the best way to enlighten yourself is to befriend someone who does it, ask questions, and have fun! Previous Previous post: What is a “Bear” in Gay Culture? Next Next post: WHATIS WITH THE ‘QIA’ IN LBGTQIA?